All Other Los Angeles Areas! Looking for a great Los Angeles Tutor? From elementary all the way up to college and graduate school, our experienced team at Grade Potential ensures that you’ll receive the highest quality tutoring on your way to achieving your goals, all at an affordable price! We've worked with thousands of local students, so we know what it takes to be successful around here. Los Angeles tutors are spoiled for choice with the rich cultural heritage of the United States second most densely populated city. The area of land where the bustling city of Los Angeles now exists was first claimed by a Portuguese-born navigator and explorer; his name was Juan Rodriguez Cabrillo. He explored the west coast of North America on behalf of the Spanish Empire. It was over two centuries until the first mission was built in the area in 1771. A decade later, a group known as ‘Los Pobladores’, forty-four settlers in total, decided on the area as their home and set about building their community. They were responsible for building their town then called “El Pueblo de Nuestra Señora la Reina de los Ángeles de Porciúncula”. This translates in English to "The Town of Our Lady the Queen of the Angels of Porciúncula". The exact geographic area of this pueblo lays in downtown Los Angeles, in the historic district of Los Angeles Pueblo Plaza. The name would eventually evolve into simply Los Angeles as we know it today. Los Angeles experienced its biggest boom time, as most cities, through industrialization. The Southern Pacific Railroad line reached Los Angeles just 16 years before oil was discovered in the city in the 1890’s, and soon California, thanks to Los Angeles, became the country’s largest oil producer. Naturally this saw big movements of folks into the area in search of work, and resultantly, the population swelled. Los Angeles sudden population growth put a great deal of pressure on the cities then limited water supply. There was a rush to build the Los Angeles Aqueduct, and it was built with certain permutations in the city’s charter. The aqueduct clause effectively stopped the City of Los Angeles from providing water to any area outside its borders. Los Angeles tutors often speculate on the unintended results of this city law, a law that inadvertently led to the cities further growth. Adjacent cities were essentially forced to annex themselves into Los Angeles in order to quench the thirst of their respective populations. The twentieth century saw Los Angeles grow to include perhaps one of its most famous districts, Hollywood. This part of the city was, and is, the center of the world’s film industry. It was this then new industry income that kept the city afloat whilst many other cities in America suffered more readily during the Great Depression. The Hollywood sign is one of the most famous landmarks worldwide, and is instantly recognizable. It was erected originally as an advertisement for a local real estate development, and actually spelled out ‘Hollywoodland’. The sign originally illuminated and flashed in segments ‘Holly’, then ‘wood’, and then ‘land’ and then the whole sign would light up. It was only supposed to be up for about 18 months, but the sign outgrew its raison d’etre and stands tall to this very day. 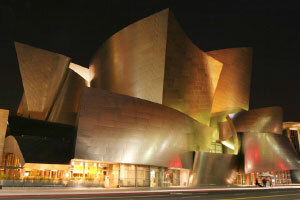 Disney Concert Hall in Downtown L.A.
Grade Potential Tutoring is proud to provide Los Angeles students with the opportunity to win a semi-annual college scholarship of $1,000! We are proud to assist students with their investment in education. Many local families trust us with their educational investment on a regular basis, so we feel great about giving back in a similar way! Click below to learn more about our scholarship program and how to apply.